Created by Paul Bracq as a celebration for the 1972 Summer Olympics in Munich, the Turbo showcased innovative design features. Paul Bracq was Director of Design at BMW during the formative period of the 1970’s. The Turbo was one of his most striking creations. One of the greatest cars in the vast BMW stable is the 1972 Turbo prototype or concept car, created for the 1972 Summer Olympic Games in Munich, Germany. In 1972, the eyes of the world were squarely on Munich, Germany. BMW had built a new corporate headquarters, remarkably styled on the shape of the cylinders of a 4-cylinder engine. A satellite building houses BMW museum pieces. And for the occasion, renowned designer Paul Bracq created an innovative design for a BMW automobile, the BMW Turbo. Only 2 Turbos were ever built. 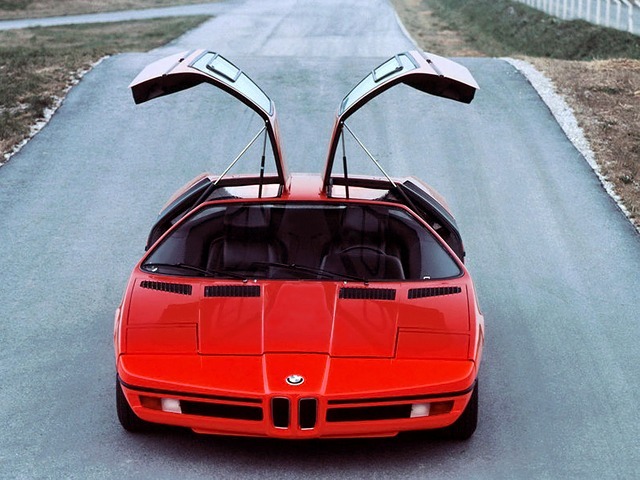 Today, it is one of the rarest of BMW’s, with its elegant design, gullwing doors and futuristic cockpit. Inside, the Turbo had a number of safety features, while on the outside it had large window areas, a distinguished, sloping front and balanced proportions throughout. The Turbo was powered by the 4-cylinder 1990cc turbocharged engine with 280 hp at 5200 rpm and a top speed of 165mph. The Turbo was BMW’s first mid-engined car.